The battle-royal game Apex Legends, which appeared on Monday, February 4, counts 25 million players a week later, publisher EA reports Tuesday. The battle-royal game Apex Legends , which appeared on Monday, February 4, counts 25 million players a week later, publisher EA reports Tuesday. More than 25 million players have already tried Apex Legends . During the temporary highlight, according to EA, the game was played by more than two million people at the same time. Apex Legends was announced and released on February 4. Within eight hours the game reached a million players and within three days that number grew to ten million. The game is a so-called battle-royal game, similar to titles like Fortnite . Sixty players are dropped on an island at the same time, where they have to switch off until one player or team remains. In the game players earn objects or money with which items can be bought. 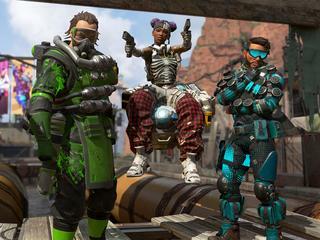 Apex Legends is free, but players can unlock characters or buy currencies to buy cosmetic items. Players can also purchase an Apex Legends Battle Pass from March. Then they have three months access to all temporarily available items that are available during a season of the game. Seasons in Apex Legend last three months. Later this week, a special event starts with objects around Valentine's Day. Major competitor Fortnite from publisher Epic Games now has more than 200 million players. At the peak, 8.3 million players simultaneously met each other.